Mommom died today. Or maybe it was ten years ago. In either case, today’s event feels more cathartic than sorrowful. 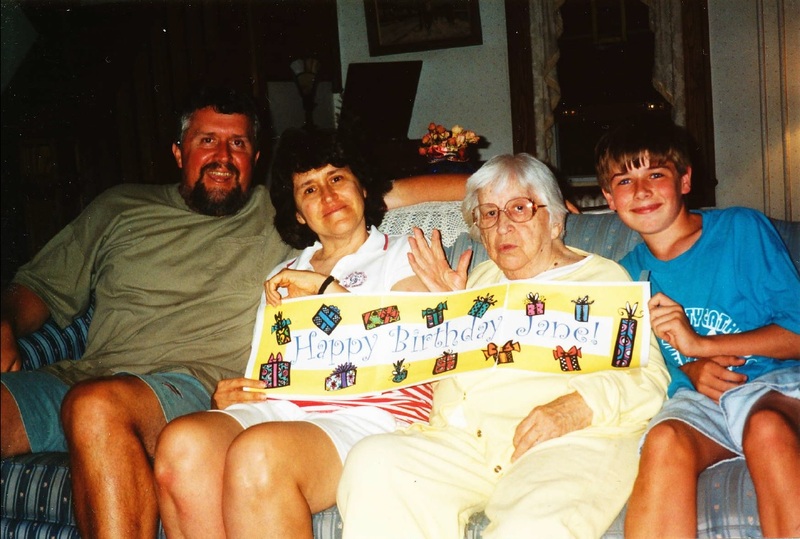 Alzheimer’s began to rot my grandmother’s brain when I was a kid. I have no concrete memories of her before the disease set in. There are a few vague hints. I recall a hazy, possibly composite scene, with my family crowded around her dining room table to eat. An aroma of macaroni and cheese filled the air. She’s full of gusto and has so much life. My first full memory of her is a game of tic-tac-toe. The board was a large wooden coaster. A 3×3 grid was bored into its surface, each hole separated from the others by a painted blue #. We took turns claiming territory by planting yellow and green golf tees in the coaster. On her move, she placed a tee on top of one of mine, demanding “King me!” We all thought it was a great joke and laughed. She laughed too. A few years later, Alzheimer’s had begun to ravage her mind. She picked up the habit of endlessly singing ““I’m bidin’ my time / ’cause that’s the kind of guy I’m.”” Never the whole song, just those two lines. Over and over, she was growing dizzy. It’s these goofy stories that hold a place in my heart. Kurt Vonnegut said that “Laughter and tears are both responses to frustration and exhaustion. I myself prefer to laugh, since there is less cleaning up to do afterward.” Embracing the absurdity of my grandmother’s illness was the only way I could accept it. Plus, those were the days of my life when she could still function in some capacity. About ten years ago, her mental state began to worsen at an accelerated rate. What was once a relatively innocuous – and occasionally humorous – case of dementia crumbled into vegetation. She lost the ability to leave her bed and shrunk down to Yoda’s size. She could mumble out short streams of syllables, but they didn’t add up into words. We could never tell how conscious she was. I’m not exactly sure how long this process took, but it’s how she’s been embedded in my mind for the past decade. Until today, she just chugged along, even outliving several of her caretakers! And I’ve lost track of how many times she’s been on hospice. She kept going and going, our little Energizer bunny. So today’s news wasn’t a surprise. The only shocking thing was how long she survived. It’s given me time to reflect on her life – and her death. It feels like this entry has been brewing in my mind for years, waiting for her spark to bring it to life. My only sadness is that I never truly got to know her; she seems to exist as a collection of my emotions instead of as a person. All I can do is attempt to piece together her image from family’s recollections. Before I was born – and before she was afflicted by Alzheimer’s – my father described how “her keen and kindly eyes radiantly light up their whole neighborhood in her face from behind her horn-rimmed glasses. She is affectionate, sympathetic, and passionate. I think it is her passion which captivates most people.” I wish I had known her during those days because even my early, vague memories are of a lively and tenacious woman. She still played a key role in my development. Her condition helped foster my interest in cognition and consciousness. What did she lose in her decay? It had to be something essential to being human. My curiosity partially arose as a coping mechanism. Learning about what happened to her helped make things less scary. It let me form a protective barrier of scientific jargon, to distance myself from the pain. And as I grew older, I recognized how she influenced my views on death. For one, I’ve always known that it’s not the worst possible fate. There are far more terrifying ways for one’s self to get extinguished. Beyond that, death isn’t necessarily a bad thing. It can bring release for the individual and for their loved ones. For this reason, I’ll never be able to oppose euthanasia. Part of me has been waiting for this moment for years. I’m a secularist; I have no idea what lies behind the black curtain. Yet I can’t imagine anything being worse than being trapped in a body and brain that have ceased operations. With her passing, my fears have subsided somewhat. No prison is permanent, she’s found her freedom. Rest in peace, Mommom.